At the recent Agritchnica Exhibition Krone was awarded a gold medal by DLG (German Agricultural Society) for the joint Competence Center Isobus (CCI) terminal. Kubota Tractor Australia are dealers of Krone products in Australia. The DLG award recognizes the commitment of agricultural manufacturers and CCI members in the development and implementation of the first universal and easy-to-use Isobus control system for Isobus compatible farm machinery. The Isobus control system standardises electronic hardware and software components for agricultural machinery. That means all manufacturers should develop their machinery under the same standard. As this is still not the case and communication problems are still occurring with certain machinery, the CCI was founded in spring 2008. Among the founders are the Bernard Krone GmbH Agricultural Machinery division together with the farm machinery manufacturers Amazone, Grimme, Kuhn, Lemken and Rauch. The new Isobus controller developed by CCI is the first controller in the industry that reliably operates on different brands and types of machinery. In the past each implement needed its own specific controller. The new Isobus controller sits in the tractor cabin and, for example, can view the functions of a Krone silage wagon or Big Pack square baler, and also works with an air seeder or fertilizer spreader of other manufacturers. The new Isobus terminal features high-technology details and an ergonomic design. While the focus of the terminal is clearly on the man-machine interface, the system provides any ports required to interface with appropriate software and hardware. In addition to this gold medal, Krone received two DLG silver medals, one of which went to the new Krone VariStream system. This is a variable and automatic system that adjusts the cross-section of the crop flow to the current amount of material passing through a Big X self propelled forage harvester. For this purpose, the rear end of the cylinder floor is mounted on springs to give way to load peaks, for example when the harvester is picking up uneven grass swaths. Once the load peak has passed the chopping system, the base plate returns to its former position with the help of pressure springs. The back plate of the blower chute is also mounted on springs, which adjust relative to the current crop flow in this area. In addition, the front end of the cylinder floor is bolted to the opposite shear bar so that it is automatically readjusted when the knives are sharpened and the shear bar is repositioned. The system gives the additional benefit of reducing fuel consumption and wear. The second Silver medal was awarded for the new EasyCut 32 CV float system. 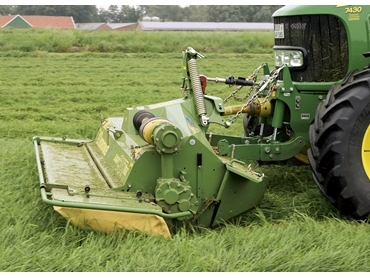 Krone is the only manufacturer currently marketing a front-mounted disc mower with pushed headstock and a suspension system that integrates the coil springs in the machine's headstock. The system balances varying coil spring tensions as the machine is following varying ground contours. A sophisticated kinematic system maintains the ground pressure of the mower.